Early Japanese woodblock map of China showing Great Wall. 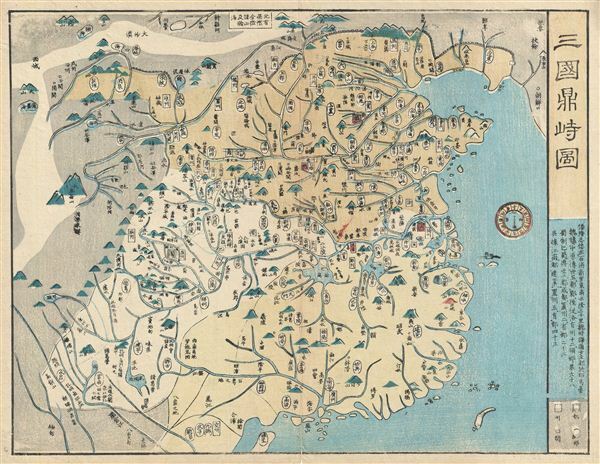 A rare and appealing c. 1820 Japanese woodblock map of China. The map covers all China from the Great Wall to Hainan. Names numerous cities, provinces, and rivers. Topography rendered in profile. Beijing and Shanghai are highlighted in red. Taiwan or Formosa appears in the lower right quadrant. Very good condition. Original centerfold exhibits some wear and verso reinforcement.